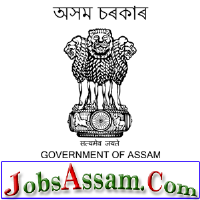 Directorate of Town and Country Planning, Dibrugarh Recruitment - Junior Assistant : The Directorate of Town and Country Planning, Dibrugarh invites applications for the post of Junior Assistant under its establishment. 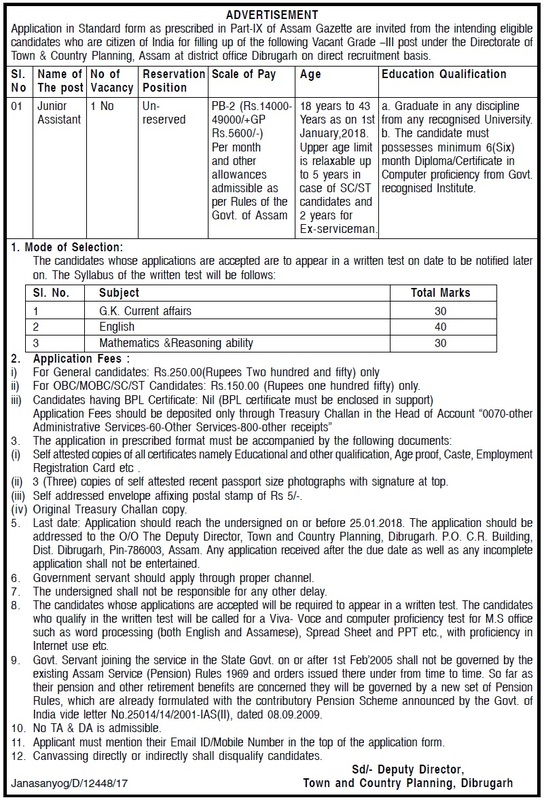 The post is Grade – III and will be on direct recruitment basis. Application should be submitted in the Standard Form. Salary: Rs. 14000 – 49000 + G.P. 5600/- + Allowances as admissible. The candidate must have passed Degree Examination in any discipline. The candidate must have possessed a minimum 6 (six) months Diploma in Computer Applications / Knowledge from an Institute recognized by the Government. Age limit : Relaxation are there as per the rules of the government. The candidates who qualify in the Written Test will be called for Computer Proficiency Test (Practical). How to apply : All eligible and interested candidates have to apply in the Standard Application Format. An application fees in the form of Treasury Challan of Rs. 250/- ( Rupees Two Hundred fifty) has to be paid. For OBC / MOBC / SC / ST Candidates: Rs. 150/- (Rupees one hundred fifty) only. Self attested copies of all certificates namely Educational and other qualification, Age proof, Caste, Employment Registration Card etc. 3 (Three) copies of self attested recent passport size photographs with signature at top. Self addressed envelope affixing postal stamp of Rs. 5/-.